Not in My Name has been published by Oberon Books and is available through all major internet booksellers. The book includes a series of comprehensive and adaptable Teachers’ Notes designed to aid school staff and other adults working with young people in relating its content to topics around Prevent within the school curriculum. Originally written for a young cast, the play is suitable for performance by any group of young people, with potential cast sizes ranging from eight to over thirty. If desired and practicable, Theatre Veritae will be happy to advise on and support indpendent school productions. The script retails at £8.99 (rrp). Education discounts are available for bulk purchases made via Oberon Books. 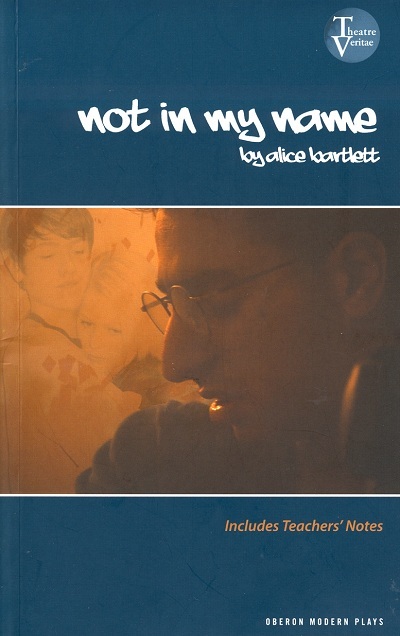 Not in My Name is licensed licensed for amateur performance by Samuel French Ltd on behalf of Oberon Books. Please use the following link to check availability or to apply for a license quotation. A percentage of any royalty fees generated from sales of the script or performance rights will be donated to the charity Victim Support in recognition of their own work supporting victims of terrorist atrocity and hate crime.